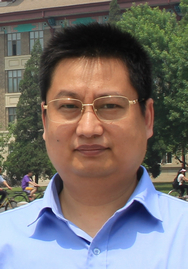 Zheng-Ling Yang (Yang Zheng-ling, or Yang Zhengling in Chinese journals), male, associate professor. He received the Ph.D. degree (Science Doctor in Engineering, in China degree system) from Tianjin University. He is a master supervisor in two specialties (approximatively corresponding to “department” abroad) of “Control Science and Engineering” and "Software Engineering". He is selected into the large national literature and annals, “The Brilliant Course - Achievement and Exploration of 50 Years Since New China”. He took part in “The Scientific Diathesis Education Curricula Backbone/Cadreman Teacher Senior Seminar” originated by Ministry of Education The People's Republic of China in November 2008. In the Student Academic Symposium of Graduate School to Celebrate the 100th Anniversary of the Founding of Tianjin University, and the Symposium of Electric Power & Automation Engineering Department to Celebrate the 100th Anniversary of the Founding of Tianjin University, October, 1995. The related papers can see Transactions of Tianjin University (2011), Journal of China Academy of Electronics and Information Technology (2011, 2008). There are two possible defects in the definition of base unit Ampere in SI (The International System of Units), Chinese Academy of Sciences “Scientific Wisdom Sparks”, 2012. His conference speech in “The Scientific Diathesis Education Curricula Backbone/Cadreman Teacher Senior Seminar” originated by Ministry of Education The People's Republic of China, Nankai University, 2008. In forecasting theory and technology, he suggested “Mechanism model + identification model” strategy for prediction of complex systems’ behavior. Refer to “Sciencepaper Online” (2006, 200609-432), and “Highlights of Sciencepaper Online”, 2007, (1): 83-87. This strategy is employed to the electrical load forecasting, wind power forecasting, and highway traffic flow prediction. In addition, some fundamental problems in computing complexity of theoretical computer science, theoretical physics, and foundation of mathematics are concerned by him.